Prerequisite course requirements exist for students who have completed their baccalaureate studies in a non-business discipline, or who lack one or more of the prerequisite courses. Prerequisite courses may be taken at either the undergraduate or graduate level at an accredited academic institution. 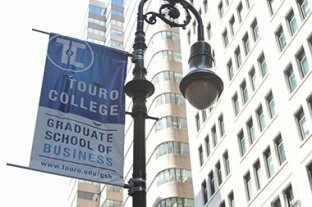 Touro Graduate School of Business offers these courses during summer sessions as well as during the regular academic year. Today's service-oriented economy presents opportunities and challenges to the business environment. Business managers need to navigate through a formidable array of new products, emerging markets, international partnerships and mergers, and developing technologies. The Master of Business Administration program provides a broad view of the functional areas needed by business managers. These include corporate finance, economics, strategic planning, marketing, and accounting. The global business environment has become an increasingly powerful force in the strategic decision-making of business executives. Students approach international business in a comprehensive fashion, developing expertise in various business disciplines, understanding multicultural influences in international enterprises, and developing awareness of ethical issues in a global economy. The Master of Science Program in Human Resource Management prepares students to build and manage human resource management functions in global organizations. This practitioner-oriented degree provides knowledge, competencies, and skills needed to help develop human capital. The interdisciplinary curriculum integrates key concepts, themes, and best practices drawn from psychology, sociology, and anthropology in positioning the human resource professional as a key organizational enabler. The degree prepares students to help promote organizational growth, profitability, and sustainability. New government regulations, greater scrutiny of corporate finances, and business growth have fueled the need for accounting professionals with deep knowledge of the important role accounting information plays in corporate decision-making. The Master of Science in Accounting program provides a knowledge base for the essential functional areas needed by accountants. These include budget planning and control, audit and evaluation of controls, financial measurement, documentation, and reporting. This program prepares candidates to satisfy the 150-credit educational requirement for taking the uniform CPA examination. Expected Shipping Within 7-15 Working Days. Eco-Friendly Printing Ink. Sour Odor Is Normal Situation. Vanish After Washing. Choose Your Item After Read Info Clearly. Shipping Of 7-16 Days. Please Be Noted And See If This Is Ok With You.